Engine Four stroke, 90°“L”twin cylinder, SOHC, desmodromic 2 valve per cylinder. Rear Suspension Cantilever fork with De Carbon unit. roadsters from the racing frames. It was the latter machine we tested, and underneath the twin headlamp fairing it is all racer. At the heart of the Ducati's excellent handling is the Harris frame. Not that Harris claim any responsibility for the design, it is a replica of the Ducati racing original. The Hertford company produce these frames with their usual superb standard of craftsmanship. The one-inch diameter, 17 gauge tubes are Reynolds 531, joined by bronze welding with inline gas flux. The frames are plastic coated by Dave Rayner, a process which involves heating the frame in an oven and then dipping it into a vat of aerated plastic particles. The plastic melts onto the frame and hardens after the chassis is removed from the vat and allowed to cool. The Rayner Ducati is a racing machine that you can ride on the road: if you want a civilised middleweight roadster then forget it. 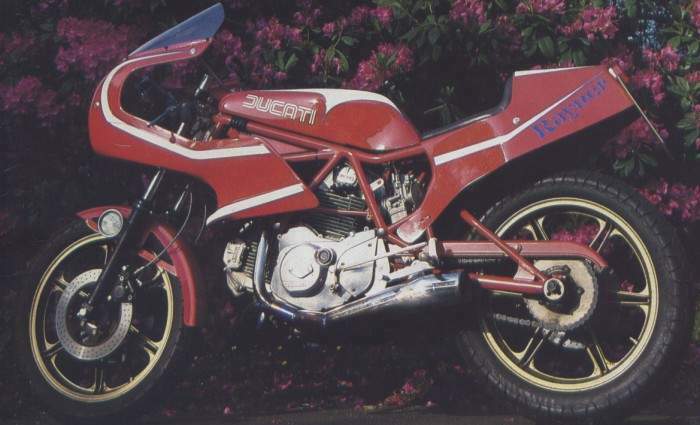 But if you want the superb handling and braking that only a true racer can offer then the disadvantages of the Ducati, and there are a few, will not put you off. you run out of road and when you do, you are likely to be cornering at high speed. It is a difficult feeling to relate, but the essence is that if you choose the correct line for a corner then the Ducati will accomplish its task at a speed that will satisfy any road rider. This means that if something unexpected occurs, then man and machine are going to be in big trouble. Finding a patch of oil, dust or a car in the wrong place once committed on the Duke is a frightening thought, because with its narrow handlebars and steady steering the machine will not change direction rapidly. high-speed cornering is no criticism of the machine, but merely an observation on high-speed riding down country lanes. On the open road only highly illegal speeds would test the cornering ability, and the Duke was well capable of them with a top speed of 123mph. At that pace the engine did not seem particularly hurried and was not running in the red. The final drive ratio has been changed to make best use of the increased power. First is still low enough for town use because the engine is flexible enough and the raised gearing keeps the noise down a little. The bike is still far too noisy; to enthusiasts it makes a superb noise, but for every enthusiast it pleases it will annoy several hundred non-fanatics. Just as importantly, the noisy exhaust restricts the rider because it is bound to attract the attention of the law and only the most unthinking "oik" would enjoy making noise that so alienates others (I wish that were true). You certainly don't need the noise to attract attention because the machine has looks enough to get all the envious glances most egomaniacs should require. I would rather have seen a smaller fairing on the machine as the twin headlamp unit seems to dominate the otherwise petite bike. Quality of the fibreglass moulding on the fairing and seat is very good and the tank is absolutely superb. Its shape is precisely the same as that of the works machines and it's made in glass with a special aluminium coating inside to cover legalities. The tank cap is an aluminium threaded plug which stuck occasionally. The petrol taps need switching onto reserve after only half of the four-gallon tanks has been used and if you try to do that while riding along, watch out. The taps are situated just above the exhaust header pipe for the forward cylinder. Woe betide you if you aren't wearing thick gloves and I hate to think of the consequences of a leaking tap. Riding position was as comfortable as any racing crouch, which obviously puts a lot of weight on the wrists. Similarly the seat is spartan but not uncomfortable for an hour's ride. The gearchange wasn't perfect and it was possible to miss changes and the blame for this can be laid on a poor gearbox, with the problem accentuated by the gearchange linkage. I was more than willing to accept awkWard petrol tap operation and fuel that shot out of the breather tube as the tank warmed up in the sun, but I think that the sidestand really should be changed. I am one of those fallible individuals who occasionally leaves sidestands down. If you do that on the Duke then you are likely to be pitched down the road, because the stand cannot flick up as it can with a rearward folding stand. changed—the tubes have been spread slightly and the belt covers are fitted. The engine for the Rayner Special is available in various states of tune to suit the buyer. Our test machine had been bored to 643cc, with the compression ratio raised from 9.5 to 10.5 to one. The inlet valves have been enlarged from 38mm to 41 mm. As tested, the machine costs £3,500 including VAT. I don't think that the tuned motor is really worth having, as a standard engine with a quieter exhaust which Rayner car supply would be quick enough anc more useable. All in all I loved the racing Duke, i was great fun to ride and fabulous posing value. I didn't mind the lack of indicators, mirrors and other civi lised accessories, but then I didn' have to use the machine as my sole means of transport.